Dating as far back as the Edo period in Japan (1603–1868), furoshiki was first used to keep together one’s personal belongings while bathing in public bath houses. Since then, furoshiki has expanded to wrap and carry just about anything. This wrapping cloth in particular was created through a process of indigo dyeing that involves the application of paste as a resist. 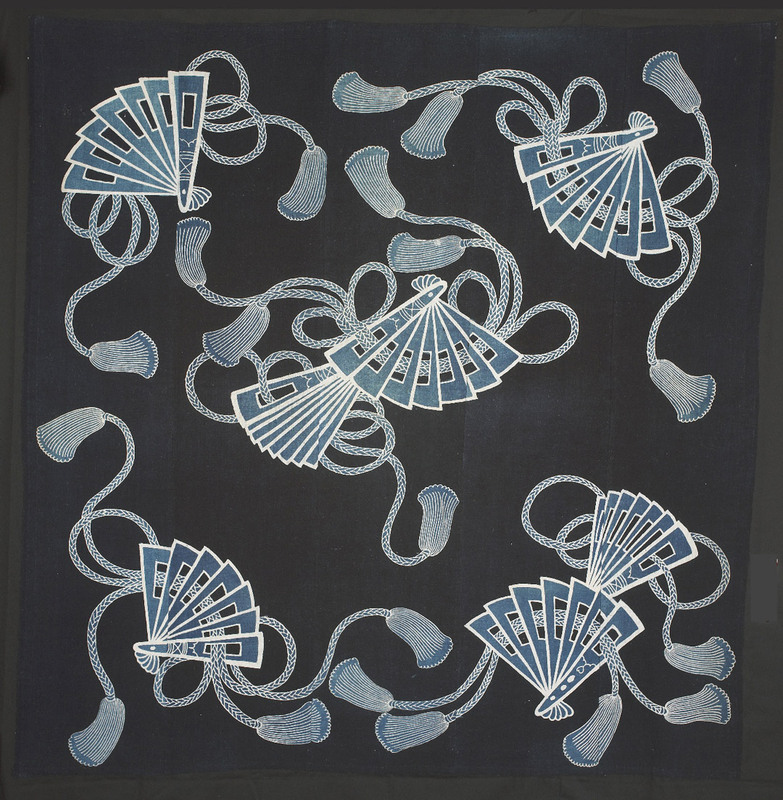 To make the fan and rope design, the artist would have painted the resist directly onto the fabric, which would in turn block the penetration of indigo dye into its cotton fibers. Before each submersion, the paste would be reapplied in order to achieve the subtle and varying shades of blue seen here. In addition to being a work of art in its own right, furoshiki falls within a larger tradition of tsutsumi, the Japanese art of wrapping and packaging. Employing a number of different materials and techniques, tsutsumi was meant to protect, and often transport, gifts in a simple and elegant manner; traditionally, an artfully wrapped gift was meant to be contemplated before being opened, if opened at all. Beginning with a simple square of cloth, furoshiki can become any number of utilitarian (and reusable!) objects with a simple pleat, twist, or knot: a purse, a lunchbox, a bottle carrier, gift wrap—you name it. For a small sampling of its possible permutations and folded formats, just take a look at the graphic below. 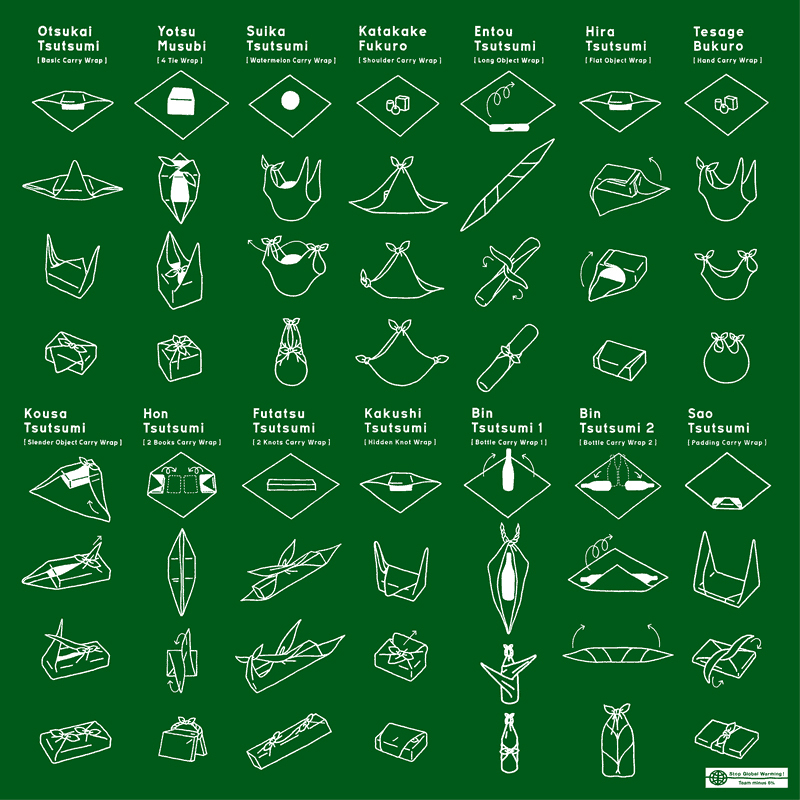 Christmas is in four days, so plenty of time to become furoshiki masters! Image: Wrapping cloth (furoshiki), 1868-1912, Japanese, cotton, freehand paste-resist dyeing, 65 3/8 x 64 3/4 in., Gift of the Christensen Fund, 2001.500.